Social media isn’t a fad and it’s not something for the kids to enjoy. As much as some people would like to believe otherwise, it’s also not just a platform for people to vent socio-political outrage. It is a fact of life and an overall important way that people communicate in this day and age, covering everything from politics to social trends to fandom, to business and education. As a law firm, it’s important for you to know how to take advantage of this important means of marketing your business and educating people about your service. Discover the importance of social media for your law firm, and the most effective social media platforms to move your law practice to the next level. Social media marketing delivers a very significant return on investment for your business, with over 90% of marketing professionals agreeing that using these platforms has improved market exposure. Over 70% of marketing firms state that they get higher loyalty levels from their clients via social media marketing, and over half of all those who engage in at least a year of this marketing have developed new partnerships. Just an hour per day on social media marketing can improve your lead generation, create higher revenue streams, improve customer loyalty and greatly increase your exposure. Of course, you need to pick the right platforms to ensure you’re getting the most out of your efforts. If you choose only one social media platform (and there’s no reason you should use only one), choose Yelp. It’s designed specifically for businesses. It allows customers to provide reviews of your legal services, and it can vastly increase your credibility if you can encourage your clients to review you on that site. Even the occasional negative review can be overshadowed if you can garner a lot of positive reviews. Videos are where it’s at these days. People feel like they are engaging more directly if they have a video to watch. YouTube is the number one video site online today, and it offers the best traction for search engine optimization, as well as tons of opportunities to improve your content delivery and boost your online rankings. Next, to videos, photos are the next most important element of social media today. Instagram is universally recognized, and it’s a great way to lead people to your content. It offers optimal use of hashtags, and you can provide a range of promotional offers through your photo sharing efforts. The leading “interest board” social media site out there, Pinterest allows you to create boards with common themes where people can go to research a given interest. Pinterest offers potentially unparalleled opportunities for viral marketing and you can reach millions of users fast with this platform, especially if you add URLs to your posts to redirect to your website. There’s nothing like bite-sized content, and Twitter is the original leader in this area. Give your clients or potential leads information in 140 characters, share images, use hashtags, and link everything to your other social media networks and your website. It’s another great way to find yourself going viral if you hit the right tweet. No doubt about it, if you’re looking for B2B options, every business should have a LinkedIn profile. Even for finding individual customers, your attorneys should have LinkedIn profiles, which serve as an online c.v. and resume. This site allows you to clearly show your qualifications, successes, abilities, area of focus and more. Of course, any social media effort is incomplete without a Facebook page. Facebook is already custom-tailored for business use, allowing you to create professional profiles, boost posts, and even connect to other social media platforms. Facebook allows you to directly engage with clients using text, images, video and more. 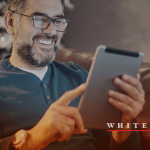 You can re-target videos for dynamic campaigns, and tens of thousands of companies make great use of their paid advertising platform. It is the single most effective social media platform in the world, and you need a Facebook platform. The heart and soul of every law practice are the clients, and to generate leads you need to educate people that you’re out there and that you offer the services they need and which they can trust. 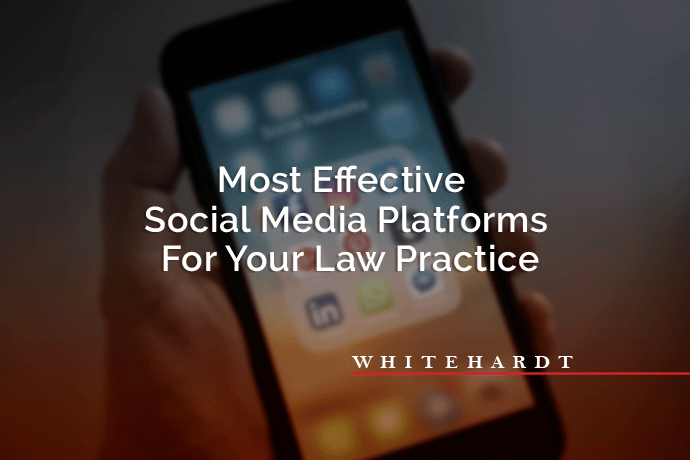 If you’re interested in more information about how social media platforms can take your law practice to the next level, Whitehardt can help. Get in touch with us for a consultation today.